"You know you're an extreme parent if your child, who does not have a documented learning disability, has more than three tutors." 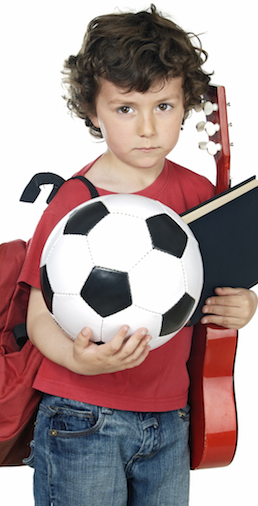 "You know you're an extreme parent if you imagine that your child is going to play professional sports even though no coach has predicted this outcome." "You know you're an extreme parent if you have your child take 30 practice SAT exams before the actual test." "You know you're an extreme parent if the school decides to suspend your seventh-grader for doing something wrong and you show up at the school with a notebook full of laminated pages that contain every gold star, every sticker and every congratulatory comment any teacher ever made about your child in elementary school and claim that your child cannot possibly be suspended because he has always been 'so good.' "
Those real life stories come from Michael Thompson, a psychologist who has seen extreme parenting on the front lines for many years -- and who has been called-in by hyper-achievement schools all over America to guide parents on how to tone it down. Here's what I want for Father's Day: I want my children to develop a passion for science. I've decided to grease the wheels. 152 people perished. Everyone on board. Everyone except a 14-year-old girl named Bahia Bakari. Children's stories are driven by the child being away from parents, experiencing things on their own. Summer camp is today's Hogwarts.